A new patent awarded to Apple reveals a method that would allow an accessory lens to be placed over the camera sensor of an iPhone, and adjust for any placement of the accessory that forces it to be misaligned with the phone's sensor. In other words, the patent would help if an accessory lens, when properly attached to an iPhone, was not centered correctly with the handset's own camera sensor. 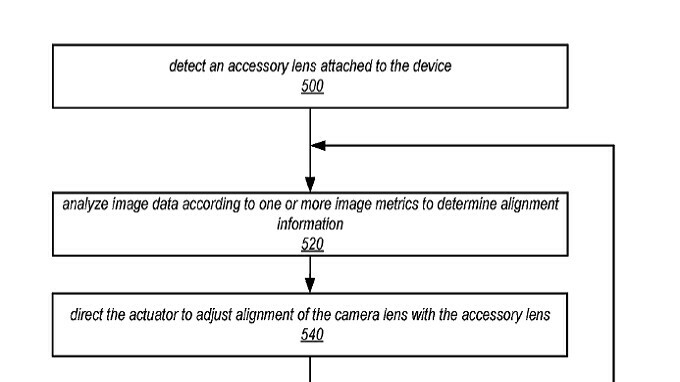 The patent, titled "Adapting camera systems to accessory lenses," would actually have the iPhone make the adjustment. Once the device senses that an accessory lens has been added, it would use image data to check for any problems in aligning the phone's sensor with the accessory lens, and make the necessary adjustments to the phone's sensor by "using a mechanical or optical actuator, for example to align the camera lens optical axis with the accessory lens optical axis." While analyzing the image with the accessory lens attached, the iPhone's camera technology would look at things like "sharpness, relative illumination, optical distortion, chromatic aberration, vignetting, magnification, field of curvature and other factors. The resulting analysis would determine what the iPhone's camera sensor would have to do to align perfectly with the accessory lens. This could include moving the sensor from side to side, up or down, tilting the sensor at a certain angle, or moving closer or further away from the accessory lens. The new patent, US10,031,312, was originally filed by Apple back in August 2016. Check out some images from the patent by tapping on the slideshow below. Just wow. Never seen anything like this. The bubble is too small. It is official guys. Apple will be getting rid of the front and rear facing camera. You will have to buy a separate camera dongle in order to take selfies or landscape photos..